The Absolut Company produces the world’s number one premium vodka in the picturesque fishing village of Åhus, Sweden. Every one of the 50 million litres of Absolut Vodka sold annually is distilled and bottled right in the centre of town in the midst of the shopping district. 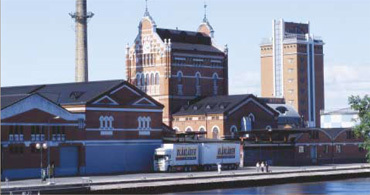 However, during the 1990s as production expanded to keep up with worldwide demand, the company faced the problem of increasing capacity without disturbing the unique architecture of the 850-year old town. This meant fitting all the process equipment into one plant-that could be built on an empty lot on the premises and, at the same time, maintaining the historic look of the red brick buildings. 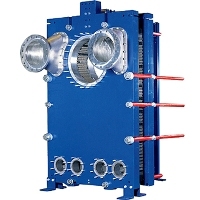 One vital component in the distillation process isthe heat exchangers and the heat transfer equipment for the new plant had to fit the strict requirements for compactnessand energy efficiency. After extensive investigations, the Absolut Company chose Alfa Laval’s plate condensers and reboilers for all four distillation columns and could fit them into a fraction of the space needed for shell-and-tube heat exchangers. AlfaVap reboiler works magic on any company's evaporation and conden-sation costs. AlfaVap units take up much less expen- sive space, thus greatly reducing the investment cost. The plate evaporators have performed excellently since they were installed in the autumn 1995 and, in fact, we haven’t opened them since we bought them.